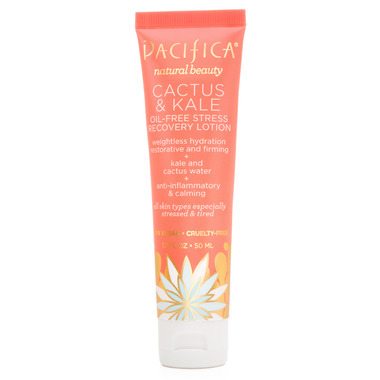 Pacifica Cactus & Kale Recovery Lotion breathes vitality back into dehydrated, tired and stressed skin. Factors such as acne, sun, polluted environments and daily emotional stress tend to aggravate and make skin appear dull and can even make it more sensitive. Utilizing holeosome technology and infused with vitamin rich cactus water, kale extracts, aloe vera and calming calendula, this formula is designed to bring the look of youth back to your face. Good for all skin types, even acne prone. It pains me to write an ok review about Pacifica because their products are usually amazing. I'm very grateful they are vegan, natural and cruelty-free. This product also did not cause any breaking out which is great, but this product was just ok. Like another reviewer I saw no improvement in my skin. After applying it my skin still felt dry and I would wake up in the morning with dry skin after applying it overnight. Everyone's skin is different so a product that does not work for me may work for you. Really love this product! Doesn't make my skin break out (which is a huge plus) yet keeps it well moisturized. I think my skin looks happier since I started using this. Definitely a keeper! I appreciate the ingredients of this product. Unfortunately, there was absolutely no improvement in texture and appearance. I'm really enjoying this lotion. It's hydrating and gentle on my face. I really like how my skin is looking these days. I've been using this for nearly two weeks and I'm in love! It's a light lotion, perfect for normal to oily skin but still delivering moisture unlike a lot of moisturizers. It's vegan and full of beneficial ingredients!